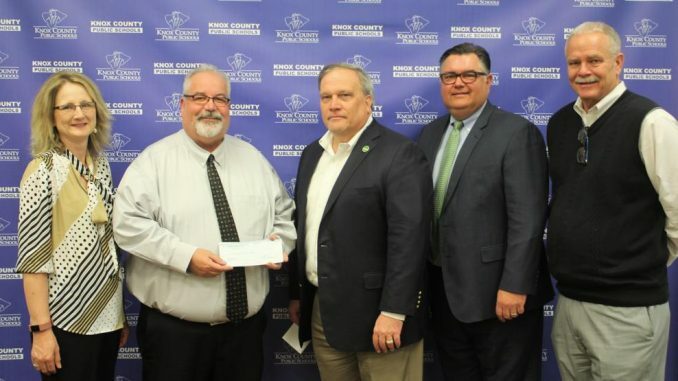 While April brings with it tax refunds for individuals, Knox County and other districts across the Commonwealth are receiving a different type of refund check. The Knox County Public Schools were visited by Senator Robert Stivers on Tuesday with a refund check in hand. The refund was for payments the school district made as a former policyholder of the now defunct Kentucky School Boards Insurance Trust Workers’ Compensation Fund, or KSBIT. On June 4, 2014, the Franklin Circuit Court approved an assessment plan to recover the amount of the projected deficit for the KSBIT Funds. This plan ordered the assessment to be pro-rated among former members of the Kentucky School Boards Insurance Trust Worker’s Compensation Fund, including Knox County. In 2014, KEMI (Kentucky Employers’ Mutual Insurance) accepted $37 million in claims liabilities for the defunct KSBIT. KEMI offered schools interest-free loans and planned to handle the claims at no cost. Knox County’s total workers’ compensation assessment was $307,763 and the Board agreed to make installment payments to retire this assessment by paying 25% down and paying the remainder over six years. The district made its’s first payment in 2014-15 and the district’s last payment will be due in 2020-21. Why the refund now? Statewide refunds are the result of effective management by KEMI to control claims costs to Kentucky schools. As a result of successful claims handling, the court approved refunds to be distributed to KSBIT members. Knox County’s share? $64,441.93. While Knox County still has two more years of payments to make, this may not be the only refund coming to Knox and other school districts according to KEMI personnel. As KEMI continues to work with districts to reduce claims, additional funds from the KSBIT settlement may be returned to Kentucky’s schools.